Any one who has delved into the history of board gaming has encountered a legendary game called Tactics. Created by Avalon Hill in 1954, Tactics is considered the very first hex and counter game. And yes I know that it uses a square grid rather than a hexagonal one... I didn't name the style of game, I just play them. 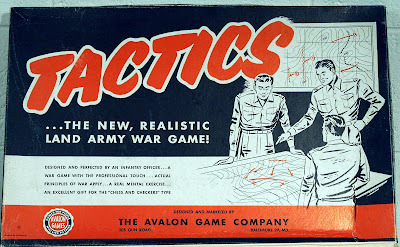 The original Tactics had a limited run, and is considered one of the rarest games there is. I have seen copies selling for as high as $5000; so it is indeed the ultimate collector's piece. However, for those of you unwilling to go on the hunt and then drop a whopping five grand, you can buy the re-implementation: Tactics II for around $40-$60. 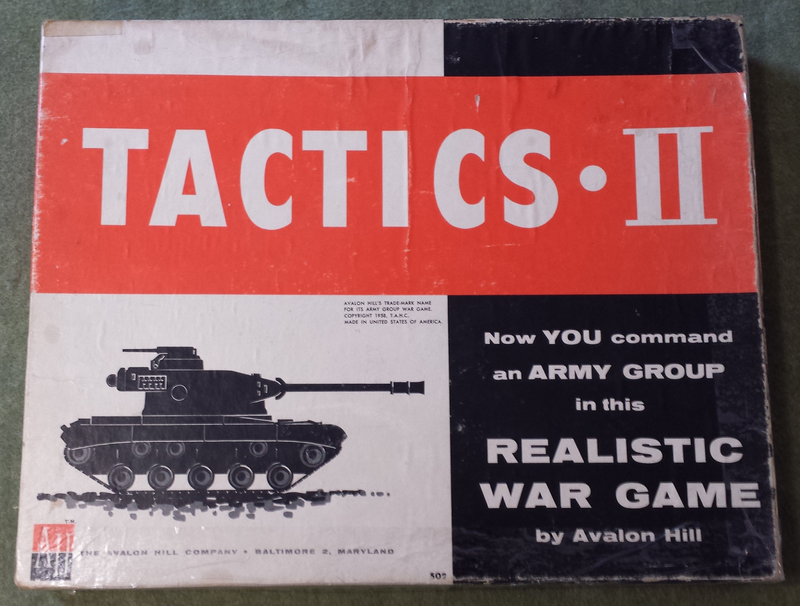 Tactics II was released in 1958, and is almost exactly the same game. Sure the map is slightly redesigned, and the pieces are a tad different. But fundamentally it is the same. 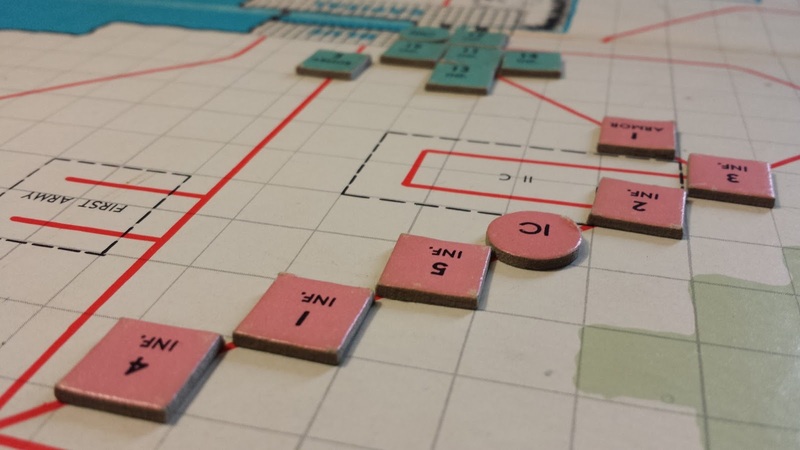 Two players begin the game by setting up the board, and dividing their units into their different corps, which are represented with the different boxes on the map. There are 6 different types of units, each with their own abilities. 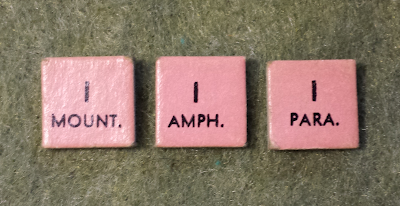 The three most common units are Command Units, Infantry and Armor. Command units in the normal rules are the same as infantry. 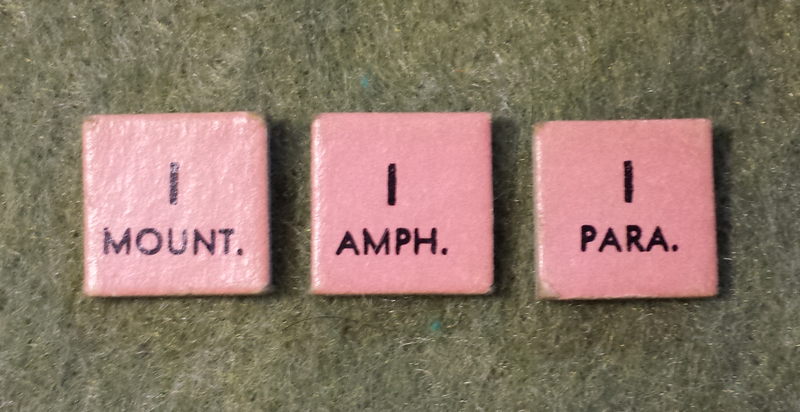 However in the advanced rules, they each hold a nuclear weapon, which is a real game changer. But otherwise they don't do anything special. Infantry are the most basic of units. They have 1 attack/defense strength and move up to 5 squares (15 on roads, 2 in the forest). There are more infantry then any other unit in the game, and you will be moving hordes of them across the map. Armor are the real heroes in this game, they have 2 attack/defense strength, and can move 7 spaces (21 on roads, 3 in the forest). Armor, of course, represents your tanks and despite the fact that they are incredible units, you only get 6 of them, so you must use them wisely. The remaining three units are special forces, and each player only gets two of each kind: Mountain, Amphibious and Paratroopers. All of these units have the same stats as Infantry, but they also have several special abilities. Mountain Units are the only units that can move across the mountainous area at the bottom of the map. Not the most useful units, but they can really make a difference in the southern area of the map if you use them wisely to control the road along the mountain side. Amphibious units are awesome. They are the only units that can cross rivers, and if leaving from a port city they can be moved to any of the beach areas on the map, making them great for quick raids behind enemy lines. Paratroopers have the most mobility out of any unit. They can be moved anywhere on the map, and then take their full move, making them a very versatile unit. However, their mobility can be their downfall. Too often have I seen them thrown too deep behind enemy lines. And since there are only two of them, they can get cut off from your army and destroyed very quickly. There are two ways to win Tactics II. You either destroy the entirety of the other team, or you control all of their cities by having only your units in each of them. By taking turns back and forth, each player moves their army and then makes their attacks. So your opponent gets to move and attack with their entire force before you respond. Positioning your units is of the utmost importance. Not only when attacking, but while defending as well: you will need to be able to recoil from last turn's assault as quickly as possible. Despite being a very simple game, the level of strategy in Tactics II is surprising, and I find that you need to really think about your moves before acting. I have found that many players have the impulse to move their units into the centre of the map and start a massive brawl; hoping their large numbers will prevail. But this strategy surprisingly never works and the player that decided to stay mobile (rather than form the mob) often wins the day. A final complication is what I mentioned earlier about position your units. You need to consider how you are creating your front lines, and which enemy units you wish to attack. Any unit adjacent (horizontal, vertical, diagonal) to an enemy unit may attack, or form part of a larger attack. 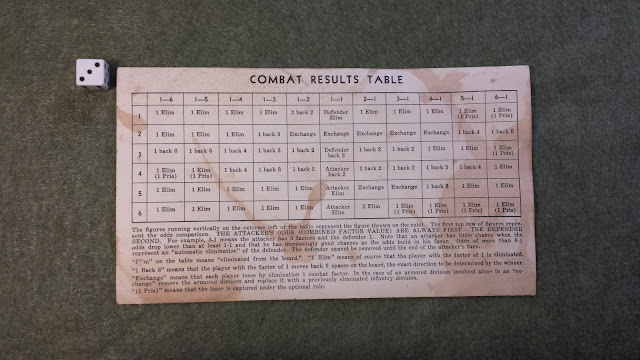 You then determine the odds of the attack and roll on a table. So position to achieve maximum destruction of the enemy with minimal loses of your own troops is vital. In combat, the number of units you put against a single unit determine the odds. So if I were to put three of my Infantry units against one enemy infantry unit, that would give me odds of 3-1: since infantry have an attack value of 1. Uneven fractions are rounded into a more natural one and then you roll on the chart and look up your result. Unlike most modern games, the effect of each roll is quite different depending on the odds, and a 6 isn't always the best roll. The possible outcomes are: Your opponent is eliminated, one of your attackers is eliminated, your opponent retreats, one of your units retreats, or both of you lose a unit. With the numbers all over the place, it means that using higher odds is better, but you have limited forces and a lot of enemies to face. You must make do with what you can get, and learn how to maximize your damage while maintaining your front line. Despite its simplicity I absolutely love this game. It is a great two player battle with enough depth and considerations to entertain an advanced gamer, while simple enough for the beginner to grasp. All in all, a game worth having on your shelf. 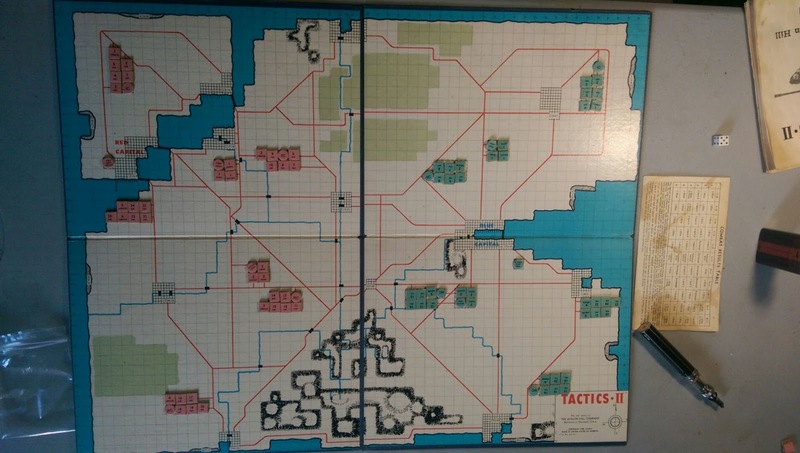 Also on an interesting note, if you are interested in running a multiplayer game you could play Tactics II with up to 10 players. Each player would control their own corp and 1 player on each team would control the reserves and special forces. I really want to give this version a try... I just need to find enough people. I imagine this would be a real game changer. Most players would only have 7 units to work with and maybe the hopes of getting 2 more from reserves. You would see some really interesting and cautious game play. Hopefully I can make this happen in the future.